When it comes to treating malocclusion, there are currently 2 main options; traditional braces, and the new cutting-edge technology of Invisalign dental aligners. Here, we will compare the Invisalign process to that of braces, to highlight how Invisalign is challenging traditional orthodontic treatment expectations. Though braces, as we know them, have been around since the 1970s, Invisalign has already changed the smiles of millions since it became an option for treatment in 1997. Here at OSD, we’ve already completed over 1,582 smile makeovers using the Invisalign system, in conjunction with our other aesthetic dentistry services. To ensure a true comparison, we are comparing treatments for issues such as malocclusion that can be treated equally by both braces and Invisalign. For both treatments, should there be existing issues like poor oral hygiene or a need for dental implants etc. that are not related to alignment, your dentist will have to address those issues before treatment can begin. While braces can be used to quickly correct issues, treatment takes on average 24-36months, though in extreme cases it can take longer. On the whole, Invisalign is a quicker treatment with corrections taking only 12-24 months. Braces are often associated with higher pain levels as they physically pull teeth in differing directions. On the other hand, Invisalign is a more subtle process which guides the teeth into place gradually. Though some patients experience discomfort, especially at the start of a new phase, pain levels are often far lower than with braces as well. Also, Invisalign aligners don’t have any exposed wires, which in braces can cause scratched cheeks and gums. Braces have come a long way from the steel railway tracks of the 90s; for a premium fee, braces can be made to a custom colour or to match your tooth enamel, so, aesthetically, they are far less obvious than before. On the other hand, Invisalign aligners are completely clear and far less intrusive for your social life; you almost can’t tell they’re even there. Though prices vary according to the treatment requirements, Invisalign is often equivalent to or only slightly more expensive than braces. This can be explained by the technology involved in the process, and the benefit of a shorter treatment time. 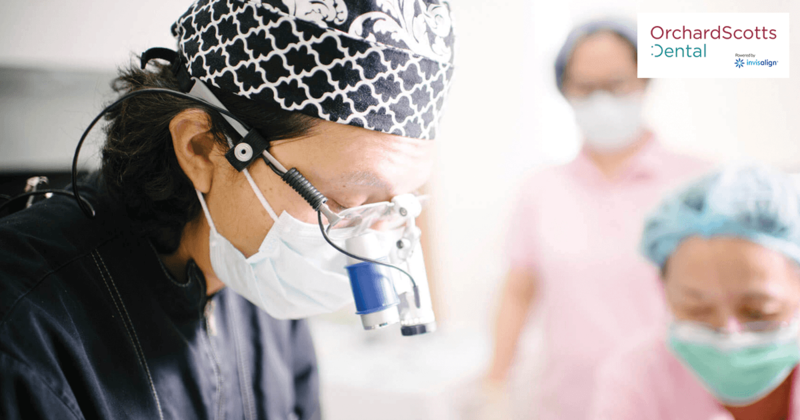 Give OSD a call on +65 6732 9939 / +65 6734 0739 to make an appointment to chat with one of our internationally experienced dentists. We’ll be able to give you a quote based on your unique course of treatment. Thorough cleaning is necessary for both braces and Invisalign, to ensure that the quality of your teeth doesn’t deteriorate during the treatment. Braces require extra care as they remain in place throughout and it’s possible for plaque to build up between the wires and brackets. Whereas with Invisalign, it’s easy to remove the aligners completely every time you clean your teeth to ensure the aligners are completely clean as well. Visit requirements vary greatly depending on the necessary treatment. When looking at braces, dentist visits are regularly needed to replace elastics, with more in-depth visits every three to ten weeks to adjust the wires. On the other hand, Invisalign allows for more autonomy; your dentists will give you several new sets of aligners to change by yourself, between visits which can be four to six weeks apart. Eating provides one of the greatest challenges when adjusting the alignment of the teeth. Braces limit the type of foods that can be eaten; sticky or brittle foods are off the menu entirely, as they can get stuck between the wires or even snap them. The only challenge linked to Invisalign is that the aligners have to stay in for at least 22hrs a day. While you can eat any food you like, you have to carefully limit when and how long you eat for. Braces don’t really require any additional care, apart from careful brushing and perhaps the use of a water pick. While Invisalign aligners are clear and convenient, to maintain that clarity they need to be regularly washed in a solution (which your dentist will recommend). Also, it is important to not wear lipsticks or to smoke as this may discolour the aligners. Though not common, there are risks associated with both treatments. Because braces are constructed from wires and brackets, contact sports are risky as a facial impact could cause serious injuries. The risk with Invisalign lies in the patient becoming lazy; aligners have to stay in a minimum of 22 hours a day, anything less than that can reduce or even negate the success of the treatment. In the case of braces, side effects can be the result of poor dental hygiene during the treatment. Poor dental care can lead to gingivitis, plaque and a build-up of tartar, which can then require further dental work. Also, cheeks and gums may end up getting cut by wires during the treatment, leaving them raw and painful. With Invisalign, there are no wires or brackets to cause damage to the teeth or mouth to cause similar side effects. However, aligners have to be removed to eat, and the teeth and aligners should be cleaned before aligners are replaced. Some patients cut down on snacking to avoid the process, and as a side effect, lose weight. Once the treatment is completed, both types require a little maintenance to ensure the positive results are long lasting. Braces and Invisalign both require the use of a retainer following the treatment’s end. A retainer will help to maintain the new position of your teeth and initially may need to be worn full time. Once your dentist is happy that the new tooth alignment has set in the mouth, they may reduce your retainer use to night times only, giving you freedom and an apparatus-free smile all day. As mentioned initially, there are various types of dental issues that can be treated equally with either braces or Invisalign. At OSD, once your teeth have been assessed, we use cutting-edge technology to take a 3D scan of the teeth, we then take photos of your smile and x-ray your teeth and jaw. This speeds up the whole treatment process, as a full plan can be visualised from day one. Also, we can focus, not only on the corrective treatment for your teeth, but also on aesthetics and your overall look, ensuring you leave with a perfect smile.